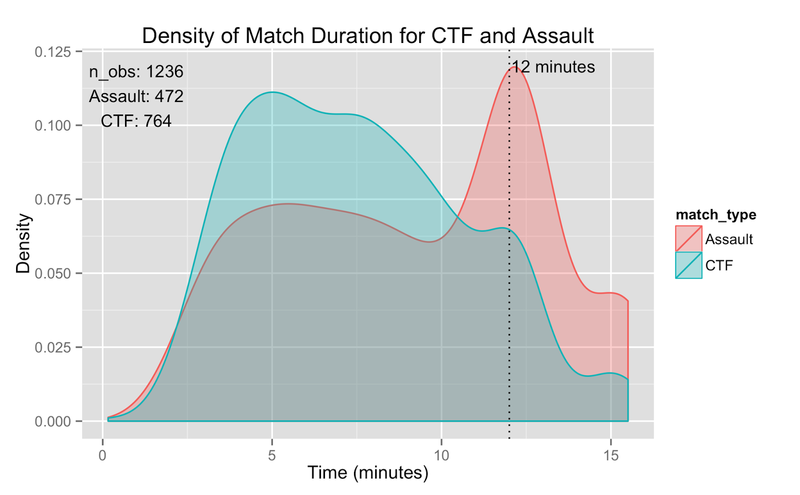 Assault creates boring, drawn-out games where even the smallest mistake by either side heavily swings the match in the others favor. This is not an interesting game dynamic and at the very least assault needs to be tweaked or, in my opinion, removed entirely from Team Arena. This is just my anecdotal opinion based on my games so far so lets grab some data from 343i's API to see if this really is the case. 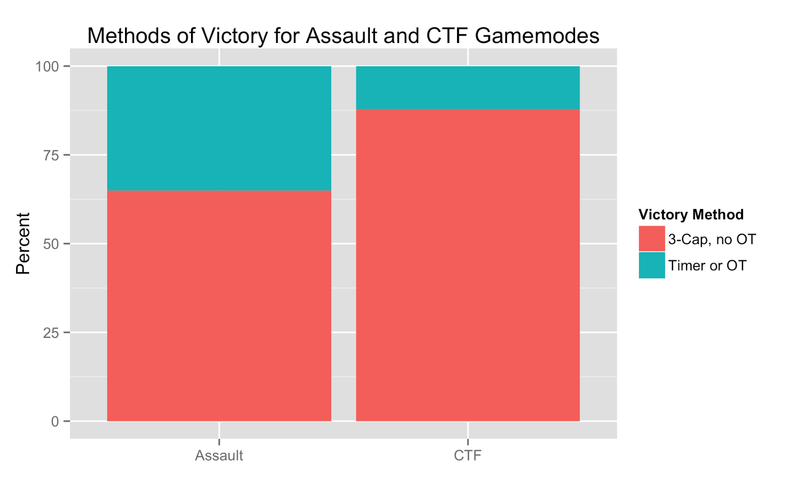 I gathered a random sample of 1236 CTF and Assault games (472 assault, 764 ctf) and analyzed their duration and victory conditions. At 12 minutes the standard game time runs out. If at 12 minutes one team has more points than the other then the game ends and the team with more points is the victor. If there is a tie when the timer runs then overtime begins and the same check is done at the end of overtime. From the chart above it's quite clear that Assault games are much more likely than CTF to either end due to the timer running out or in overtime. This is indicative of low-scoring games where neither team is able to reach the required 3 points to win. The red group in this chart indicates the percentage of games that ended due to a 3-cap (a team managing to score 3 points) before the initial timer runs out. The blue region shows the percentage of games that ended from a time-out (one team being ahead at 12 minutes) or a victory in overtime (one team being ahead after overtime or reaching 3 points in overtime). 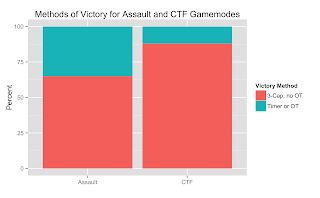 So nearly 25% more Assault games than CTF games end from the timer or in overtime. I don't have a problem intrinsically with the fact that Assault often produces long games, if the objective was an interesting one. The singular objective in Assault of 1 ball and 1 cap location produces games where decision making means less than in other game types. Since there is no question about what you should be doing at any one time it takes away decisions from the player. My other main issue is the variability. Under normal gameplay it's very difficult to cap the ball in Assault, as I have shown here with their abnormally long games. However, a single lucky kill (or unlucky death) can easily swing the game in the your favor (or your opponent favor). It's a mechanic that isn't satisfying because it feels like you're playing for that lucky kill instead of making smart decisions throughout the match. What's your opinion on Assault? Inspired by a post on the Halo subreddit showing player rankings in different multiplayer playlists in Halo 5 I decided to do something similar. 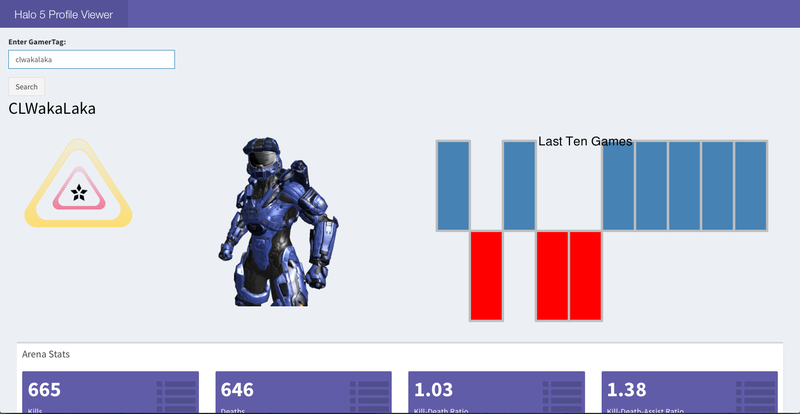 I used the Halo 5 API R package I wrote a few months ago got to work collecting as much data as I could from users. The public API has several limiting factors. First is that there's no easy way to simply get a large list of users currently playing Halo. Microsoft doesn't make public player activity numbers public so having easy access to this would probably be against their intention. To get around this I looked at my recent game history, and took all the names of the players of my opponents. Then looked at all their recent game histories. Quickly I was able to get a list of a little over 17,000 unique names that played at least some form of matchmaking. The second limiting factor is that Microsoft only allows 1 request per second. This isn't really a huge hurdle as I just left it running overnight to gather the data. It would be nicer if there was a faster option though. Anyways here are some results from the Team Arena, Slayer, and SWAT playlists. Keep in mind that when this data was gathered it had only been about 10 days since the February season went live. I'll try to do something like this again at the end of the month to see if there are any major changes. From what I've heard of 343i's Halo ranking system a near normal curve like this is to be expected. With gold and platinum ranks containing the majority of players. There are some spikes at tier 1 of each rank. This is due to the fact that in Halo 5 you cannot rank down out of a division until the next season. So if players are improperly placed into diamond or go on a hot streak and make it into diamond, they'll just end up sitting at diamond 1 most of the season. With how quick the seasons in Halo are (historically slightly over a month for pre-season and January) I don't think this is that bad of an issue, as it does relieve a little bit of 'ladder anxiety' from the matchmaking knowing that you won't rank out of a division if you go on a losing streak. 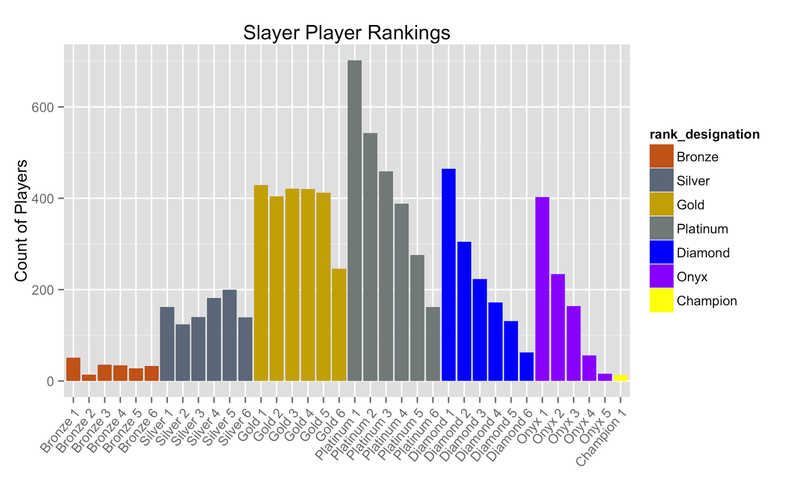 Another interesting thing is the large percentage of players currently in onyx. 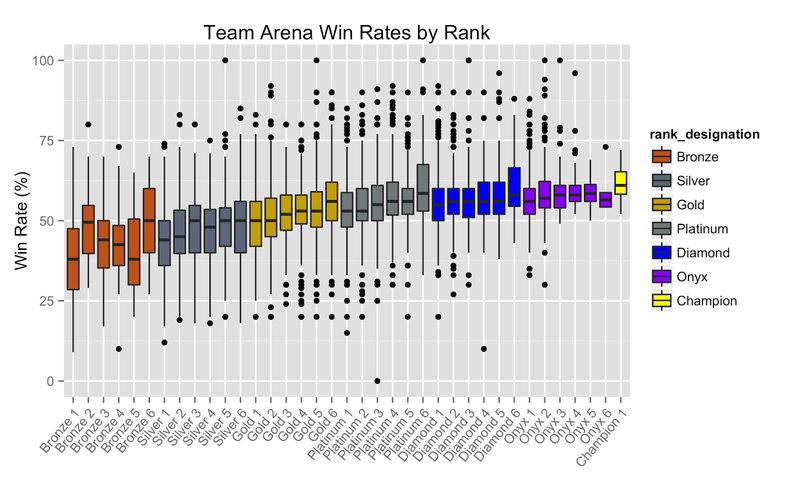 I think this is likely due to my small-ish sample size of just over 7000 players for Team Arena, and because it's still early in the season. As the season goes on the more casual players will finish their placement matches and the relative amount of onyx players will probably decrease. 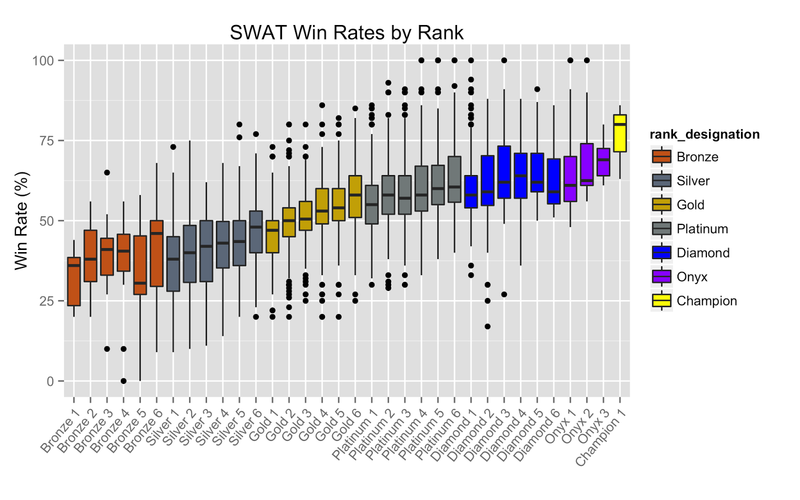 I've also included a boxplot showing win rates of players in the different ranks. 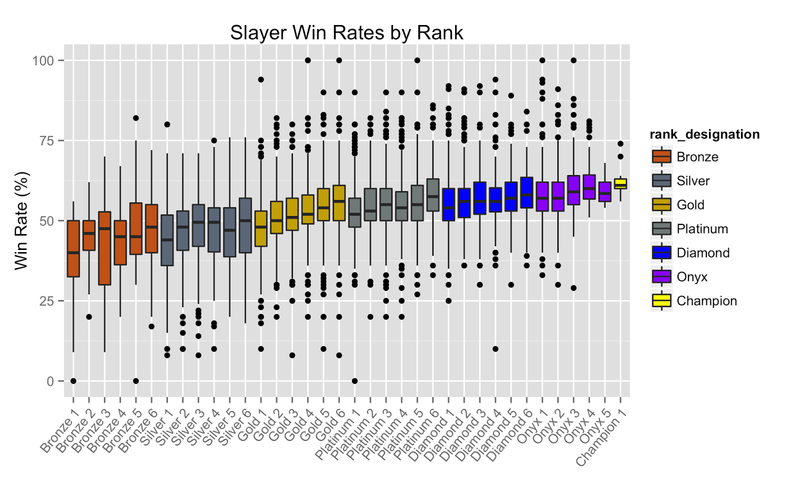 Nothing really surprising; as players rank increases so does their win rate. Though from my understanding the matchmaking system should try and give players a close to 50% win rate, so again, perhaps this will even out as the season progresses. Nothing too different in the slayer playlist other than it seems skewed towards higher ranks. I'm actually a little lost as to why this is. My best guess is that players who play Slayer might be more competitive than those that play Team Arena and combined with it being early in the season it's likely to produce these results. But again, I don't really know for sure. Maybe you have some suggestions? Compared with the other two playlist there is hardly anybody in SWAT above platinum. 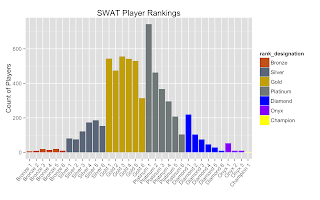 From what I've heard 343i have done some tuning for ranks in SWAT which is probably why it looks so different than the others. Well I hope you enjoyed these. Comments and suggestions on what other kinds of data from Halo 5 might be interesting are definitely welcome. What I really want to do is make some heatmaps (still) but 343i seems like they do not want to make the necessary data to do this available. Maybe soon... hopefully. Instead of playing Halo, I've been having fun with 343's public Halo 5 API. There's a remarkable amount of information that you are able to pull from them; I'm quite surprised. 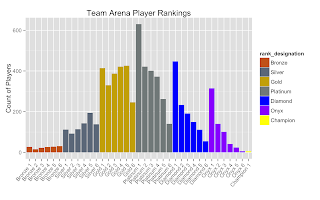 This is my first time doing anything like this so, since I'm already familiar with it, I used R and Shiny to throw together a little dashboard to let you view basic arena statistics. I might add more functionality but probably nothing serious unless it gets crazy popular for some reason. More importantly, to go along with the Shiny app, I'm working on a nice R package to allow others easy access to 343's generous amount of game data. Hopefully I'll be able to finish it up with a couple weeks and get it uploaded to CRAN or github at the very least. I was really hoping I could do a heatmap of where most deaths occur in each level. Kind of like was Bungie did for Halo 2. Unfortunately I didn't see any of that data available through the API but maybe in the future. Check out the Shiny app here and code to come! R package to access the API is now up on my github! This is a simple spreadsheet to keep track of your collection of Dreamcast games. It contain a list of every North American release, independent release, and a few European releases that never made it to North America. You can set whether you own each game or not, leave a note regarding its quality, and it will automatically count them to let you know how many games you have in your collection and how many you are missing. There is even a second spreadsheet to keep track of official hardware that you own, in case you are trying to collect all the hardware as well. PS. Apologies for the site being all but dead for so long. I have been very busy with my studies. I'm concluding something that has been eating the majority of my time. So there will hopefully be more posts in the near future. The Hanzo is a VGA box with a built-in scanliner made for the Dreamcast. A device that greatly increases the picture quality from the system and something that every Dreamcast enthusiast should own. Seeing games like Skies of Arcadia, Phantasy Star Online, and even the recently-released Sturmwind in 480p truly is the way Dreamcast games were meant to be played. For those not in-the-know know, the Dreamcast was capable of outputting a 480p VGA signal straight from the console without any modification. It did, however, require a separate device that plugged into the standard A/V port to allow this. At the time it was basically used to play the Dreamcast on a computer monitor, projector, or high-end CRT television. Fast-forward to today where everybody has high definition TVs with VGA support, it's no wonder the price of VGA boxes has skyrocketed in the past couple years. The Hanzo does not fail at its promise and the picture looks amazingly clear, crisp, and colourful when compared to the standard Dreamcast A/V cables. The difference is almost unbelievable on a modern flat panel LCD. Yet another reason the Dreamcast was ahead of its time. A large complaint that some people have with the VGA signal on LCDs is that 2D sprite-based games or games made in lower resolutions don't look authentic on modern TVs. Those types of games were usually made for arcades where CRTs were the norm and they had a very distinct look to them because of the presence of scanlines. Scanlines are basically gaps, or blank horizontal lines, produced on a CRT because of a combination of low native game resolution and interlacing on the monitor. The Hanzo attempts to remedy this complaint by allowing you to introduce visible scanlines to the picture, recreating the look of classic arcade games. I'm not a big fan of artificial scanlines; I prefer the bright, crisp look of the native picture but for those of you who absolutely love scanlines, the Hanzo does a great job. It even gives you the option of putting the scanlines on the odd lines or the even lines depending on your preference and the ability to change the size of the scanlines which I'm told looks better when the picture is upscaled. The Hanzo itself feels to be of high build quality. All the plugs and switches seem to shield the sides enough so that I don't feel it's a big deal that the box is not fully enclosed. The plexiglass on the top and bottom looks pretty slick too with the logo laser-etched into it. From what I understand, beharius (creator of the Hanzo) hand builds these. It's nice to know someone actually spent the time to produce a quality product instead of mass-producing cheap crap. This all sounds amazing right? Well there are some caveats to using a VGA box on the Dreamcast. Mainly that not all games are compatible. Some early games were shipped with a flag on the disc that prevented them from booting into VGA. The Hanzo lets you get around this by setting one of the switches to 15KHz(480i) mode to bypass the check, then switching back to 31KHz(480p) to enjoy your game. Other games are completely incompatible with VGA. For a complete compatibility list click here. The slight compatibility issues aside (most of the incompatible games are crap anyways) I am enjoying playing my Dreamcast on my HDTV in beautiful 480p. Especially Sturmwind which I just received last week and am currently working on a review for. So stay tuned! A big shout out to beharius for creating such a wondering product at a decent price. I believe he is working on an official website for the Hanzo so I will link to that as soon as it's up. While shopping at a flea market not too long ago with a friend we came across a vendor selling a strange looking NES cartridge (the one in the picture above). Neither of us had ever seen something that looked like it. 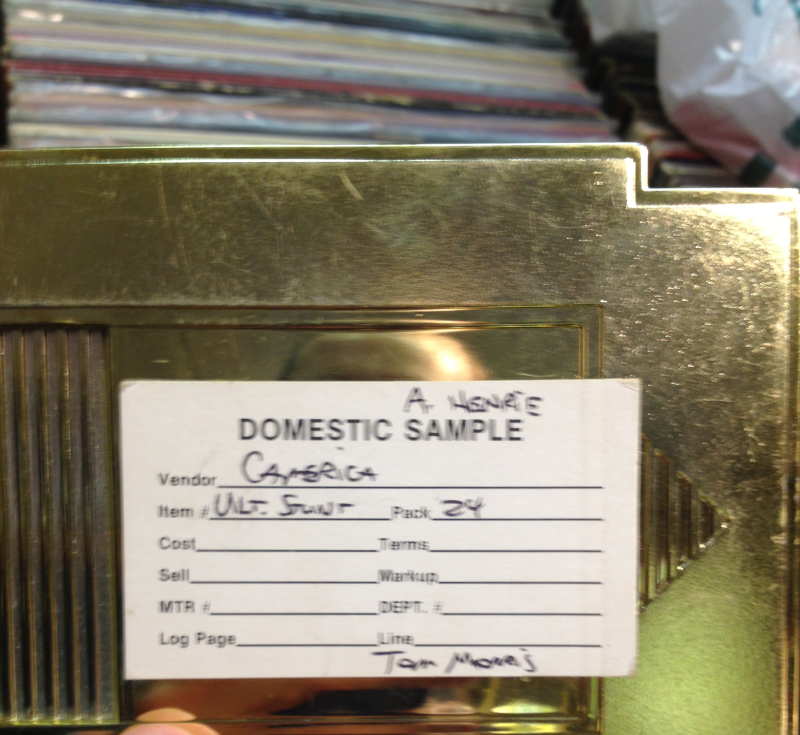 The vendor thought it was worth a lot of money so we decided to look into it. As it turns out the cartridge was nothing more than a sample Camerica game: The Ultimate Stuntman. One of only a handful of unlicensed games published by Camerica. Back in the late '80s, during the time of the NES, Nintendo had a pretty onerous publishing license. They restricted publishers to only 5 titles per year and they had to be NES exclusive for two years. On top of that it could sometimes be quite difficult for companies to actually get a hold of the cartridges for their games because Nintendo had to produce them all. Some publishers took this as a sign to start releasing unlicensed games whereby they could produce they're own cartridges and release them without permission from Nintendo. Camerica, of course, was one of these publishers. Built into every NES was a so-called 'lockout chip' preventing games from being played unless a corresponding chip was present in the cartridge. To get around this Camerica would send small voltage spikes to the lockout chip, freezing the chip and allowing their games to be played on an unmodified NES. Nintendo, not happy about this, sued Camerica several times but lost in each case and was eventually ordered to pay Camerica for damages. Camerica released 15 NES games in total mostly developed by Codemasters. All of them used Camerica's unique catridge shape and were painted a shiny gold or silver colour not unlike the the original Zelda and Zelda II carts. On the backside of each game was a small switch that allowed the user to play the game on an NTSC or PAL NES, essentially making them region-free. During Camerica's brief run they also produced an arcade style joystick for the NES with a very strange triangular shape as well as a wireless controller. Their most popular device though, was the Codemasters-developed Game Genie which they were able to release in Canada due to their close relationship with Codemasters. In America though, the Game Genie was sold by the Galoob toy company. 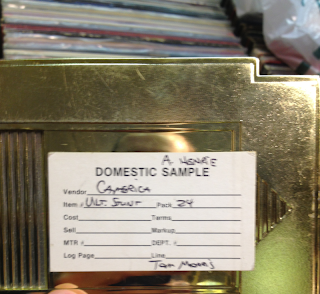 Near the end of 1992 Camerica released their final product: the Aladdin Deck Enhancer. It was basically a cartridge cradle that housed game RAM and the lockout bypass circuitry. Smaller cartridges would be placed into the cradle and the whole thing would be placed into the NES. Camerica hoped that by not having RAM and the bypass circuitry in every cartridge they would be able to produce cheaper games. However by the time of its release the Super Nintendo and Sega Genesis were already out so it never sold very well. Eventually leading to the closure of Camerica. Unfortunately for Camerica they were one of the many companies that never made it out of the NES era. But it's always interesting to learn something new about early gaming. In this review I'll be looking at the Street Fight X Tekken Fightstick Pro (Xbox 360 version) arcade controller from Matcatz. I should say upfront that I'm not much of a fighting game fan nor am I particularly good at them. However, I am told that Madcatz arcade controllers are the gold standard for fighting games. Most of my playtesting was done playing SHMUPs. This controller has several nice features that really add value. If you look at the top right of the controller, next to the Xbox button, you'll see 2 toggle switches. One of them locks or unlocks the turbo feature while the other lets you choose whether you want the joystick to act as the left or right analog or the dpad of the standard 360 controller. Which is handy if you're playing a game that only supports the analog stick for movement. Looking again at the top of the controller you will see the turbo button and 8 LEDs which correspond to the 8 face buttons, letting you know which buttons currently have turbo enabled. There is a fast and a slow turbo mode that you can individually apply to any of the face buttons. Madcatz has used arcade quality Sanwa buttons on this controller so there's no need to worry about wearing things out within a year. These parts were originally designed for arcade cabinets after all. I'm not a fan of these buttons though. They feel spongy, like you're pushing them down until they stop. There's no breakaway like there is on say a standard 360 controller face button. That's personal preference I'm sure but even after using it for many, many hours it still feels strange. The joystick on this controller is also a Sanwa so again, there is no need to worry about wearing it out too quickly. It is amazing and an absolute joy to use. The tension on it is perfect for my liking and I simply love the way it clicks from the switches inside. That is not to say it is perfect for shooting games right out of the box. Since this controller is marketed as a fightstick, Madcatz has put a square gate on the joystick. A square gate restricts the joystick movement as if it was inside of a square (instead of a circle like a standard analog stick) with the 4 corners at the diagonal positions. This is great for fighting games because it makes diagonal movement a lot easier but is quite annoying in shooting games. If you are so inclined it is possible to replace the square gate with an octagonal gate which I will probably end up doing sooner or later. If you're wondering where the start and back buttons are they are placed on the backside of the controller. A nice way to make sure you never accidentally press them. Also hiding in the back is a small compartment that holds the cable. Being able to completely put away the cable is great because it's pretty long and would be a pain to deal with otherwise. The art on the top of the controller looks pretty cool as well, displaying several Street Fighter and Tekken characters. So if you're a fighting game fan the Fightstick Pro is a great choice and has everything you would want in an arcade controller. But if you're a shooting game fan like me, or want something to play arcade games with you might want to find a controller without a square gate to save you the hassle of replacing it yourself. Welcome to BWNFB where I review great games and more!